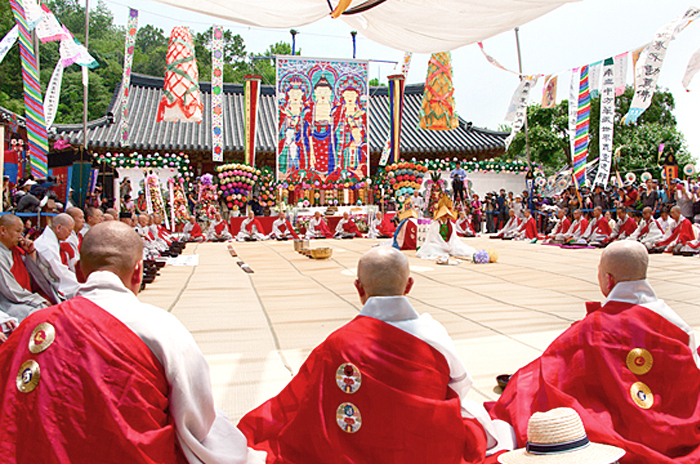 Jongmyo Jerye is a national ceremony held for the kings and queens of the Joseon Period in Jongmyo Shrine, where the ancestral tablets are preserved. The ritual is conducted by chief priests who dress formally for the ritual and prepare food and alcohol for the ancestors. 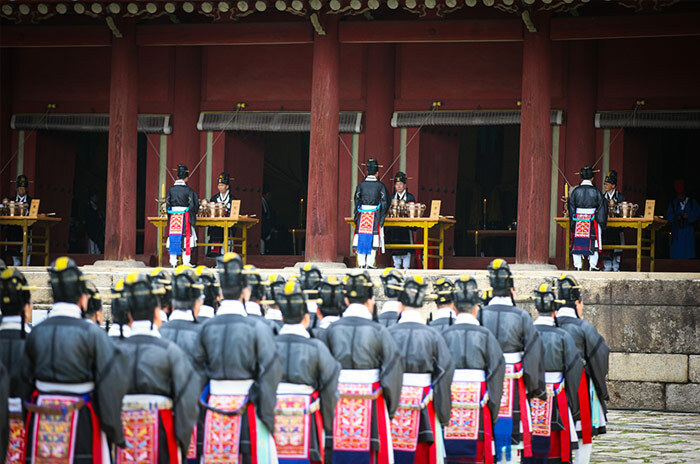 The ritual service is considered an important symbol which is at the foundation of national survival and the spirit of Korea, demonstrating filial piety toward the deceased, one of the valuable concepts of Confucianism, and encouraging a sense of unity of the whole nation. 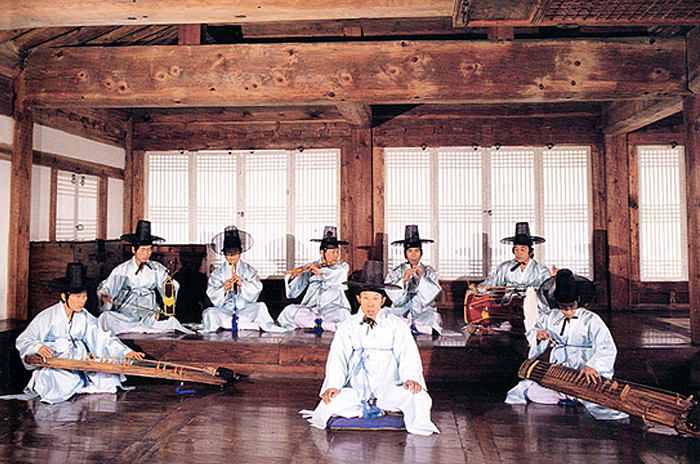 Jongmyo Jeryeak, or the royal ancestral ritual music, was performed when the royal family held a ceremony for the repose of their ancestors in the shrine, simply named"Jongmyoak." Traditional Korean instruments are used following the order of the ritual. This page was last updated on March 25, 2019, and therefore information may differ from what is presented here. 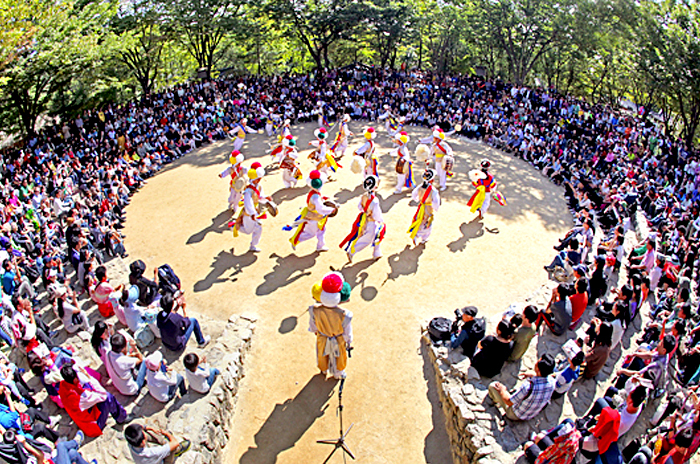 Pansori is a form of performing arts where one person tells a story using words and body movements according to the drum beat. This traditional Korean music tells a themed story that well demonstrates the culture of both commoners and yangban (aristocrats) and universal emotions regardless of class differences. With a distinct, inimitable sound, rhythm, and singing technique, diverse human emotions can be felt through Pansori, representing Korea’s unique cultural landscape. 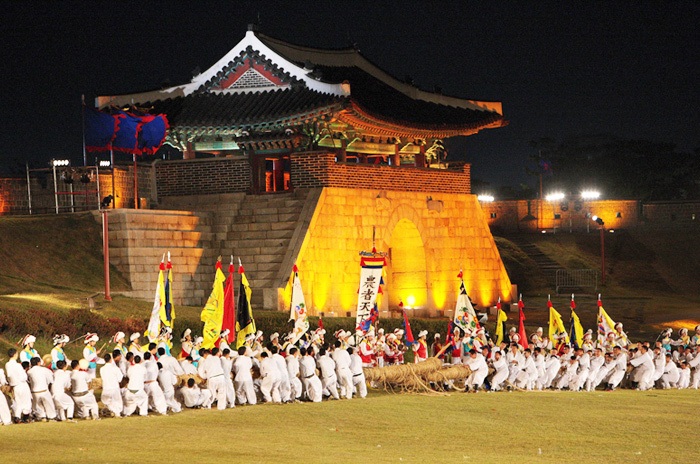 The Gangneung Danoje Festival is held around Dano, the fifth day of the fifth month according to the lunar calendar. It holds great cultural value as one of the Korea's Masterpieces of the Oral and Intangible Heritage of Humanity in demonstrating a Confucian festive rite that harmonizes well with the concepts of shamanism and Buddhism. During the festival, a shamanic ritual called gut is performed to give thanks to the gods of nature. In addition to traditional games and performances to enjoy, nation’s largest open market is also held for visitors to buy local products and handcrafts. Under a bright full moon, dozens of young women gather in a circle, join hands and sing and dance all night under the direction of the lead singer. The dance is usually performed around Seollal (Lunar New Year’s Day), Daeboreum (the first full moon of the new year of the lunar calendar), Dano (the fifth day of the fifth month of the lunar calendar) and Chuseok (Korean Thanksgiving day) holidays on the brightest night of the full moon. A folk custom developed in rural rice farming villages, Gangangsulle holds a great value in terms of passing down the spirit of cooperation, fairness, friendship and a sense of community. Namsadangnori generally refers to traditional Korean performances staged by Namsadangpae, a vagabond troupe of male performers. The root of Namsadangnori comes from the experience of the common people, and performances were staged especially for them. 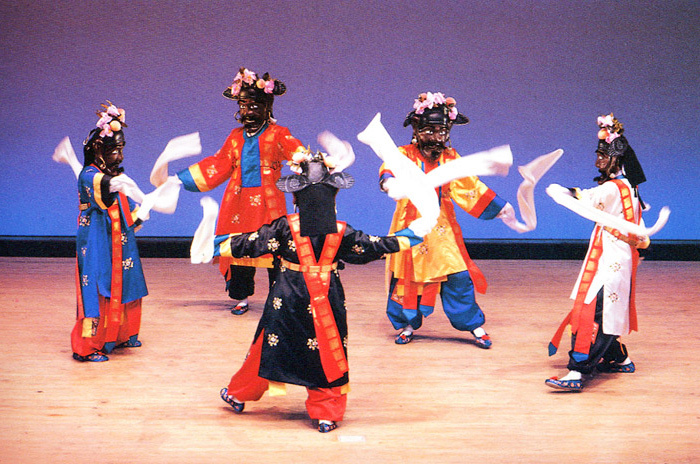 Musicians, mask dancers and puppet shows dealt with grief of the poor and disenfranchised, while criticizing the immorality of the yangban through their sarcastic humor. Tightrope walking and somersault with interesting commentary in between the acts made the stage even more exciting. Namsadangpae troupes performed nationwide and motivated the poor and powerless commoners as they were encouraged by great music, performances and dancing. Yeongsanjae is a Buddhist ritual for the deceased. Silla created the ritual when Buddhism was introduced to the peninsula during the period of the three kingdoms. 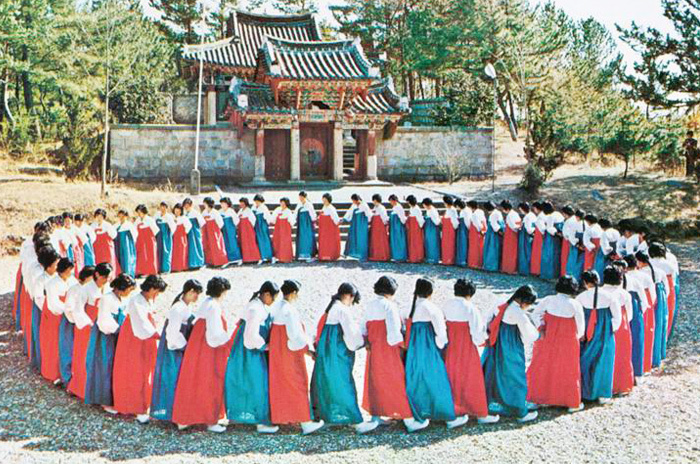 A central element of Korean Buddhist culture, the rituals are quite complicated. 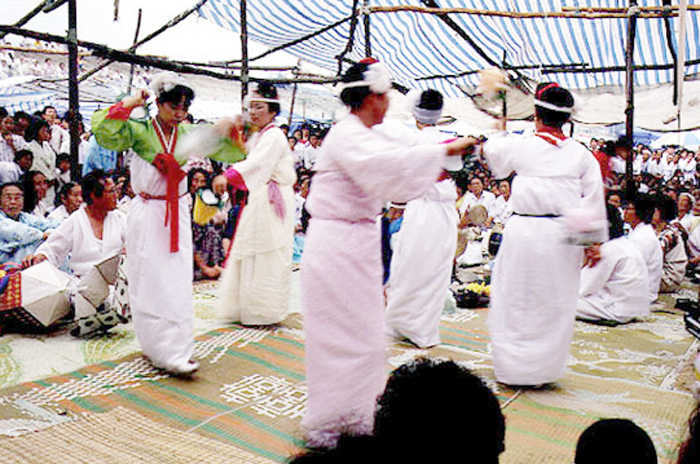 Beompae is an important part of the ritual as Buddhist words are interpreted in the form of dancing and singing. 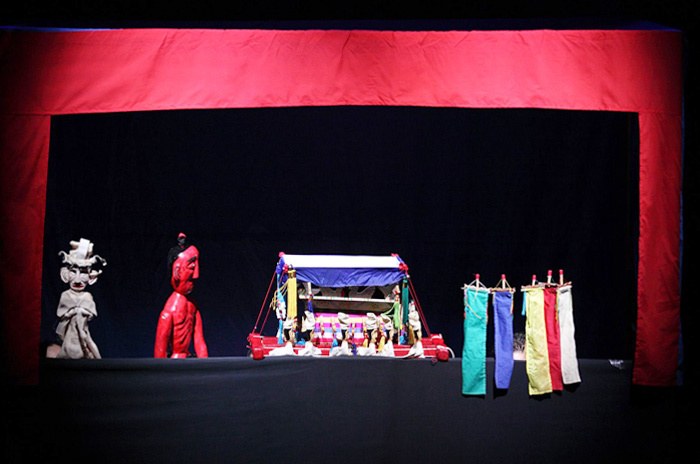 Yeongsanjae acts as a bridge to inherit the value of Buddhism in an artistic form. Cheoyongmu was formerly used to promote good fortune by dispelling evil spirits and praying for tranquility of the royal family during royal banquets or exorcism rites on New Year’s Eve. Cheoyongmu is based on the legendary tale of Cheoyong from the Silla dynasty. Cheoyong came up with his own method of chasing evil spirits away by singing and dancing. From then on, people believed that putting a drawing of Cheoyong outside of their main gate would ward off sickness and evil spirits. Later, the simple ritual to ward off evil transformed into a formal royal court dance. The dance is performed by five men clad in white, blue, black, red and yellow to represent the four cardinal directions and the center. The dancers move with stateliness and vigor through a variety of styles and tempos of music, punctuated by various lyrical song recitations. The Jeju Chilmeoridang Yeongdeunggut is a ritual held in the first half of the second lunar month at Chilmeoridang Shrine in Jeju-do in hopes of calm waters and abudance of fish. Female divers called haenyeo, ship-owners and villagers gather at the shrine to practice the ritual. The Yeongdeunggut well-demonstrates the characteristics of Korean folk beliefs on the nature of gods. 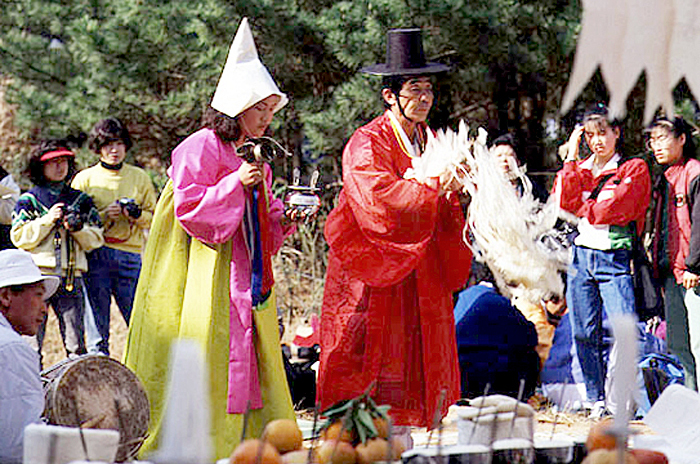 The Jeju Chilmeoridang Yeongdeunggut is the embodiment of the divers' belief of the Yeongdeung goddess and a ritual unique to Jeju, which distinctively embodies Jeju's identity and offers a sense of community to the inhabitants of Chilmeoridang village. 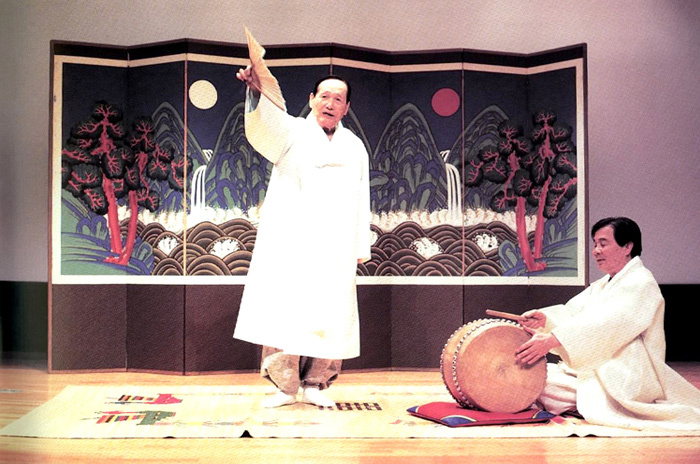 Gagok refers to a genre of Korean vocal music composed of traditional three-line poetry (sijo) and accompanied by an ensemble of native instruments, including of a twelve- or six-stringed zither and various percussion instruments. Most gagok songs are very slow, requiring a high level of concentration to control the tempo and many years of practice to perfect one's learning. The style was very strongly influenced by Korean’s characteristics of endurance and patience. Although the present form of gagok has transformed to include songs of a more fast-tempo variety, the majority of the songs still bear peaceful tunes of slow- to medium-tempo. Gagok was originally designed for aristocrats' taste, but as it became more widespread, many commoners also began to enjoy this music style. The major form of the songs has remained the same, largely distinguished into ‘namchang’ and ‘yeochang’ where the former is sung by a male vocalist while the latter is performed by female vocalist (nam- means man and yeo- means woman in Korean). The aforementioned Korean zithers (geomungo and gayageum) and bamboo flutes (daegeum, piri), combined with the fine voice of the singer, make the orchestra complete. 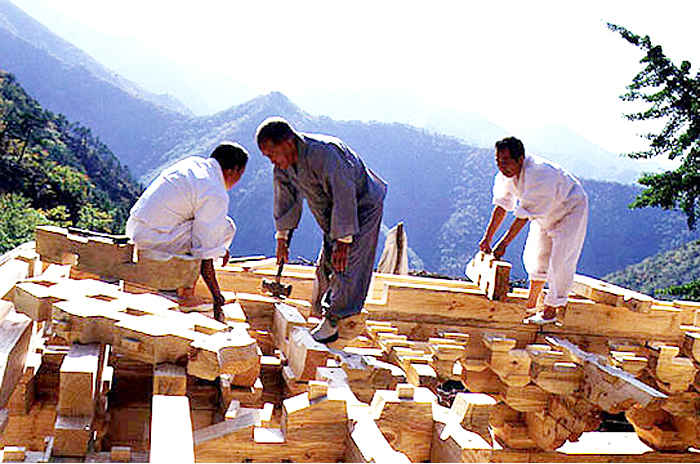 Carpenters with skills in woodworking are called moksu, and among them, the few notable figures with especially advanced skills in the area are called "daemokjang." Traditionally in the Korean architecture fields, daemokjangs are thought to be master artisans and therefore were responsible for building the royal palaces, temples and other historically significant constructions as well as repairing them when necessary. Their skills have remained highly appreciated, as good skills allow for the wooden beams of traditional structures to be seamlessly connected, perfecting the designs of Korean architecture. 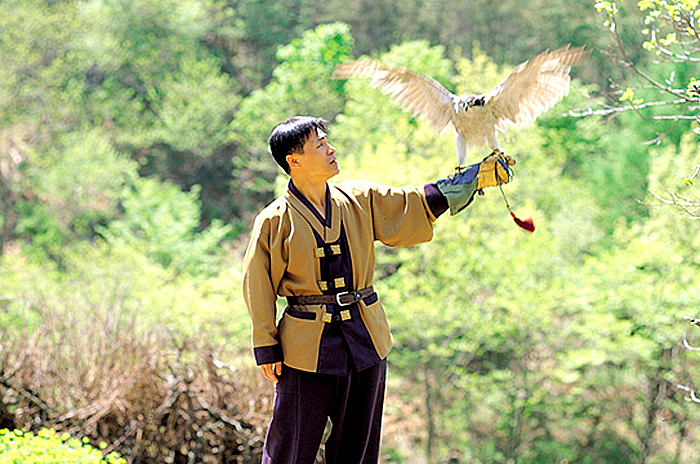 Unlike other forms of hunting, falconry is an indirect method of hunting that uses a trained falcon. Its recorded history goes back almost 4,000 years, to when hunting first originated. However, over many years, it also became recognized as a form of sport. Falcons raised to capture prey were extensively trained and in the process, became domesticated. 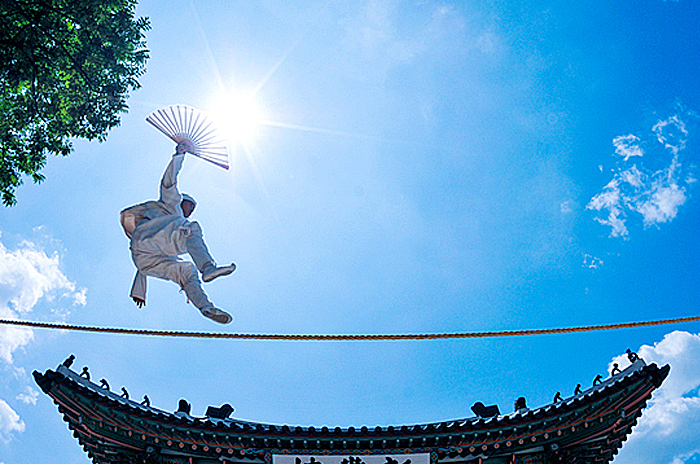 Jultagi, or tightrope walking is a traditional Korean acrobatic performance, normally accompanied by music and witty dialogue between the tightrope walker and a clown. The tightrope walker executes a variety of acrobatic acts on the rope, along with jokes, mimicry, songs and dance, displaying some forty different rope techniques. In addition to the breathtaking acrobatic tactics, jultagi is also highly valued as an interactive performance, encouraging the audience to sing along and communicate with the performers. 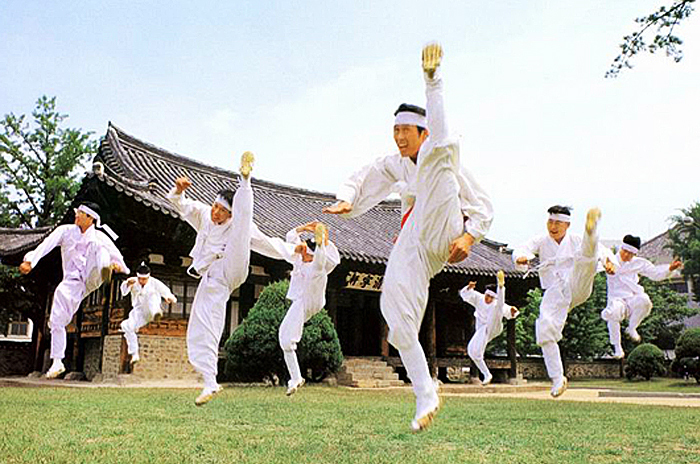 Taekkyeon is a traditional Korean martial art that dates back to the Three Kingdoms Era (57 BC - AD 676). Although it teaches fighting skills, the movements are graceful and gentle rather than straight and rigid. Taekkyeon also requires enormous flexibility and inner strength, and uses a broad variety of offensive and defensive skills so as to not hurt one’s opponent. In that sense, taekkyeon has not only played a significant role in offering an accessible sport to a vast audience, but also in promoting public health and community integration. Ramie fabric (mosi in Korean) produced in the Hansan region of Chungcheongnam-do is named after its origin of production, hence called "Hansan mosi" in Korean. The practice of weaving mosi is famous here due to its invaluable community asset of successfully passing down the technique over generations for a quality-assured outcome. 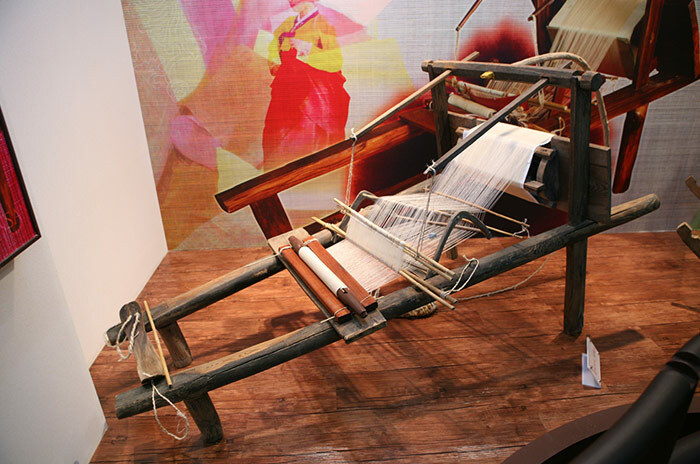 The masters of this cultural practice are credited as the middle-aged women in the township who are responsible for harvesting, boiling and bleaching ramie plants, spinning yarn out of ramie fiber, and weaving it on a traditional loom. Ramie cloth is comfortable in hot summer weather and is used to produce a variety of clothing from dress suits and military uniforms to mourning garments. Hansan boasts fertile land and sea winds that allow the ramie plants to thrive, guaranteeing a good quality product. Arirang is a popular Korean folk song and the outcome of collective contributions made by people over many generations. Essentially a simple song, it consists of the phrase ‘Arirang, arirang, arariyo’ and two simple lines, which differ from region to region. While dealing with various universal themes, the simple musical and literary composition invites diverse improvisions, giving oppportunities to be sung and enjoyed by almost all Koreans. 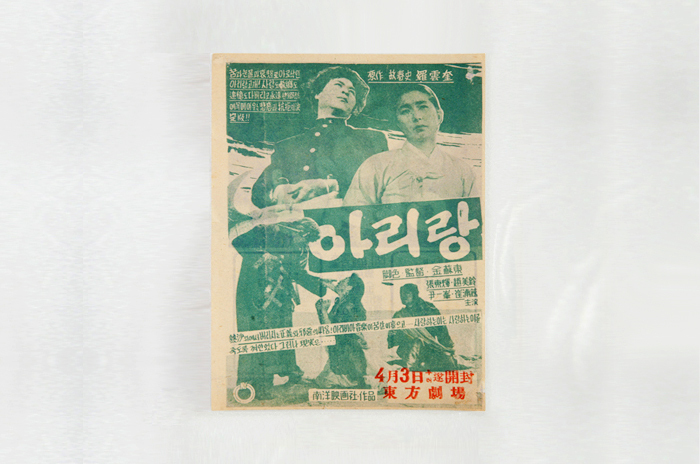 Arirang is also a popular subject and motif in diverse arts and media, including movies, musicals, dramas, dances and literatures. It is an evocative hymn with the power to enhance communication and unity among Korean people, whether at home or abroad. Kimjang, the making and sharing large quantities of kimchi (fermented cabbage) ahead of the long winter months to come, is an essential part of Korean culture. Despite being centered on kimchi, this practice has never been limited to just food preparation. 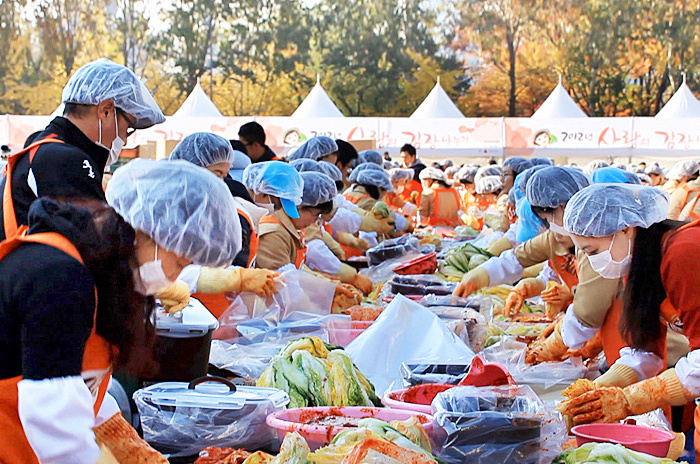 Kimjang is more of a ceremony, bringing family members together, promoting cooperation among members of society and sharing with the less fortunate. This provides a sense of identity and unity, enhancing ties among different communities. Also, it is a culture of bringing people closer to nature. Nongak is accompanied by many traditional percussion and wind instruments along with a street parade, dance choreography and acrobatic moves. Though it is often perceived as a form of entertainment today, it originated from communal rites and formal rituals praying for peace and prosperity in a family and/or neighborhood. It has evolved into a representative performing art genre of Korea with its mixed elements of dynamic energy, joy and sorrow. Juldarigi is a tug-of-war game in which many people divide into two teams, grab hold of a long rope and try to pull the rope in opposing directions. This game was generally played before rice harvesting to wish for a good harvest. Rather than just a mere game, juldarigi was seen as a ritual promoting solidarity and communication among the villagers. The villagers would gather their hopes as one to start the new agricultural cycle and the elders introduced young men into the community. Through the tugging on the rope, the farmers were able to show all the strength they had for the coming labor. 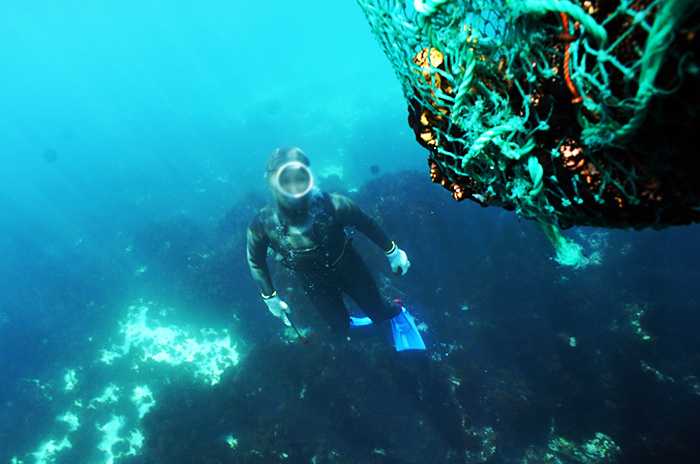 On the volcanic island of Jeju, located south of the Korean penninsula, female divers go 10 meters down without any equipment to harvest seafood in a process called "muljil." These divers, or haenyeo, spend roughly 90 days a year in the ocean, diving for 6-7 hours in the summer and 4-5 in winter. Because of the long hours in the water, the women become experts in perceiving the changes of the ocean as well as acquiring knowledge in related areas. The wisdom gathered from the sea is passed down the female line, from mother to daughter and daughter-in-law. The culture of Jeju Haenyeo is made more outstanding when considering the similarities in life and manner between haenyeo of the same generation. Ssiruem is a traditional Korean wrestling that requires strength, techniques, and endurance. The main goal is to have the opponent fall to the ground by using strength and ssireum techniques while holding grasp of each other's satba (a cloth band wrapped around waist and thigh). Official competitions take place in a ring filled with sand with a chief referee and an assistant referee to supervise the match. Traditionally, ssireum contests were held during festive holidays like on the day of Dano and Chuseok. The first national contest, called the Cheonhajangsa Ssiruem Championships, took place in 1983, triggering a nationwide popularity that was followed by regional and festive ssireum contests throughout the country.